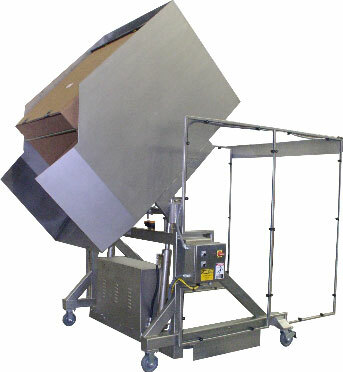 39″ discharge height, 17” reach. Accepts 45” wide x 48” deep x 54” tall containers loaded at floor level. 304 stainless steel tubular frame construction with continuous TIG welds. Glass bead blasted finish on structure. Polycarbonate guarding with stainless steel tubular frames. Electroless nickel plated hydraulic cylinders. Hoffman NEMA 4X enclosure with fused, lockable disconnect. 2 GPM hydraulic system housed in a stainless steel enclosure.